Strategic thinking is one of the important tools for the company as well as for the employees because it helps them in growing with greater understanding and taking better decisions in life. The strategic thinking process is applied so that proper decisions can be taken and one can arrive at final decision in a better manner. This process involves proper critical thinking strategies and critical skills. In order to improve the strategic thinking process, one has to be humble and down to earth because if a person will have ego problem, he or she would not be able to think in a better manner as he or she will only think that he is the best and there is no need to improve. The very first step is to question yourself. You might have people who always agree with what you do, without telling you what is right and what is wrong, so the first and foremost thing is to avoid such people who instead of telling the truth, just lie to you. Make sure you question yourself, your own opinions so that there is something better you can dig after raising the questions. In order to train yourself to think critical, make sure you make a similar bend of your mind. Be critical in thinking. Try to find doubts in everything that you come across. This will help you in developing the critical thinking process which will help in creating a greater output for you as well as your company. So, if you are always surrounded with the people who stand like an army men saying ‘yes’ all time, then I tell you it is very dangerous. Talk, sit and make a group with people who themselves are very critical thinkers. This is because when you surround yourself with the people who think in a critical manner, you ultimately get the similar kind of brain building and critical thinking process. Also end up sitting with the people who think just like you do. Sit with the people who are experienced and are more educated than what you are. So, make sure you do not fall in the similar trap of think tank. Reading about the people who thinks in a critical manner will not do much good to you. In fact, simply reading will not help you in growing your brain in a manner that it thinks strategically. Go and surround yourself with the people who think and act differently. The company with the similar kind of people will help you in improving the strategic thinking process. Every time visit new places, meet new people because this will give you a variety and you will be able to think in a different manner. This way meeting with different people, will give you an exposure in a manner that you will be able to know the heterogeneous thinking process of the people. It will also put forth various ideas and opinions that would be generated in front of you. So it is advisable to put yourself in varied environments every time so that you are able to improve the strategic thinking process. You just need to break down in a strategic manner into the business. The decisions that you make should have a strategic perspective so that the hurdles and the other barriers are known well in advance. The opportunities, hot issues, and the other constraints can only be known well when you think in a critical and most appropriate strategical manner. The strategic thinking not only helps in making a strategic plan without any flaws and hurdles but also delivers positive results. So, above are some of the points that one should follow in order to improve the strategic thinking process. 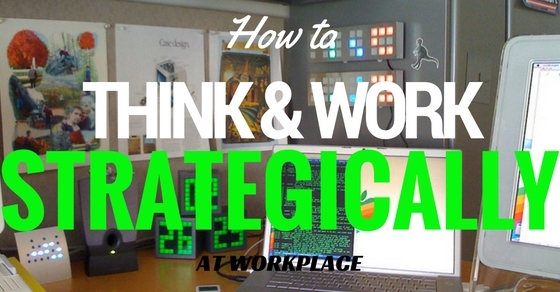 How to Think Strategically at Work? At workplace it is very important to think in a strategic manner because the work to be done at the workplace needs proper analysis and introspection, in depth knowledge. First and foremost think is to research. If you will not research for anything, you will not be able to analyse it fully with satisfaction. Also you will not be able to come up with number of queries and if you won’t have doubts and queries in mind, you will not be able to develop the critical thinking process. Hence not able to think strategically in the workplace. When you learn to make comparison and also know how to get the best out of the comparison, it simply means you have now developed the strategic kind of thinking. So, whenever you are working in a company, make sure you compare your own work with yesterday’s work because this will give you an idea of what improvement is needed and what flaws need to be corrected. So, if you want to develop strategic thinking at the workplace, just start comparison in a critical manner. You need to weigh the risks against the potential rewards. By weighing the risks you will be able to evaluate what is right and what is wrong. This way less of the mistakes and more of the satisfied output would be there. So, if you want to improve the level of thinking from simple to strategic, just start weighing the risks that you are going through because the more risks you will know, the more you will come to know about the consequences and the solutions will also be great. Once you get the knack of strategic thinking, just articulate the strategies so that everyone can understand the move you carry for the understanding of the concept. Also once you came to know about the process of strategic thinking, you will surely be able to guide others for the same and which is a great thing to know and do. This will be helpful for both the company as well as the employees within the company. So, these are some of the steps to work in a strategic manner in the workplace. How to Work Strategically to Boost Performance? The work is done strategically when only the work is planned well. So, at the very first you need to make a plan so that the work goes in a systematic manner. The systematic work is always a strategic work as it involves proper planning and thinking process is also involved. Plan before you start your work because if you will not plan, you won’t be able to put in varied queries that would help you work in a strategic manner. Second step is to collect the information and go for the introduction part. This is because working strategically means to work in a step by step manner. So, you will have to work one by one rather than just jumping to the last leg of the work. Strategically working requires immense planning and thinking process. If you will not think and work, means you are not working strategically. The comparison is needed because if you will not have a doubtful mind, you won’t be able to find the mistakes and there would be less chances of the improvement in the work done. So, if you want some improvement in the work, just work in a strategic manner and start questioning to yourself. Make comparisons with your previous work and do not repeat the mistakes ever again. Your goals should be clear and concrete as well. With clear goals you will be able to work in a systematic manner. To be clearer, you will be able to work in a dedicated way as all your hard work would be dedicated towards the specified goal of yours. Research is also very important to accomplish those goals. So, in order to work systematically you need to set the goals first and then accomplish it with utter determination. Consider what material is essential for your goals and what not. Also how much thinking process is required to achieve those goals. The strategic way of working needs more of thinking process and planning so that work goes in a continuous flow forever. So, if you want to work in a well strategic manner, better to research beforehand to get to your desired goals. You need to organize the goals in a well manner. Organizing the goals means you have to prioritise what is important and what is less important. So, in order to work in a strategic manner, just strategize the work first which means just organize your work. This is important because organizing the work automatically gives way to systematic work. Hence the work is done in a strategic manner automatically. Working on the very basics is essential. For working on the basics you need to work on the foundation of the topic you are working for. Strategy making is not difficult; it is just that it demands the utter attention and systematic work to be done. This can only be done when you clearly understand your vision. Once your vision is clear, you will be able to work in a systematic and strategic manner. So, it is essential to do your homework so that you can work in a systematic manner. You just need to anticipate it’s need because review is must as it gives a feedback that whether the work done is going on the right track or no. So, just review the work once it is done. So, above are some of the points that one should keep in mind while working in a company especially strategically. The strategic work is the work demanded in offices as it leads to intelligent and the desired output. So, if you want to succeed in life, you just need to work in a startegic manner, or you can say in a critical manner. Be your own critic first and then expect from some one else, related to your work. Find faults in your work so that you can improve yourself better at workplace.